Finding a mattress for less than $1,000 isn’t as hard as it used to be, but finding a good mattress for under $1000 is still tricky. For most people, there’s no reason to spend much more than $1000 on a mattress. To buy the most comfortable mattresses for your needs, you need to define what you want the mattress to do for you and figure out what you can afford. We’ve spent a lot of times researching various brands, reviewed a lot of info, taken the user’s feedback, analyzed the sales figure, gathered data from various specialized related sites and finally compiled the list of the 10 best mattresses for under $1000 in 2019. OUR TOP PICK: If you have tight budget then consider buying the NECTAR, a memory foam based mattress that cost less than 1000 dollars. With it’s balanced levels of support and comfort,this mattress has already earned the No #1 position as top mattress for back pain. They really offer a better mattress for a better price. Looking for even more budget friendly mattresses? Be sure to check out our roundups of the best mattress under $200, the best mattress under $300, and the best mattress under $500. Here are the latest reviews of the 10 best mattresses under 1000 dollars. Tuft & Needle is one of the best supportive mattresses are sold for under $1,000 .The Tuft & Needle 10 inch mattress is made of foam, but it is not memory foam; it is not latex, egg crate foam or springs and coils. It is instead two layers of polyurethane foam; 7 inches of support and 3 inches of T & N Adaptive foam. Adaptive foam is a proprietary compound, designed to relieve pressure points and keep you cool. Made from polyurethane, it incorporates gel and graphite to let you sleep cool without feeling sunk or trapped in the foam. 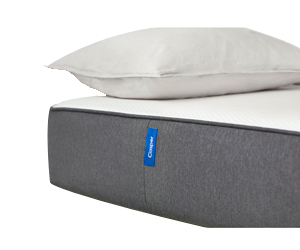 The 7-inch supporting layer gives you proper spinal alignment in all sleeping positions, while the top layer relieves pressure points, eliminating tossing and turning during the night, and also localizes motion transport – meaning you and your partner won’t disturb each other with your movements. The bed comes in standard bed frames sizes, is made in the USA and has a 10-year warranty. The mattress comes with a no-risk, full-refund guarantee and a 100-night sleep trial. Since the mattress doesn’t use spring and coil technology, it’s suitable for all pressure-sensitive individuals. If you’re willing to buy a queen mattress, the Casper is an excellent choice, and our pick for best mattress way under $1,000. The Casper Sleep mattress is composed of four layers of foam: durable support foam, adaptive transition foam, responsive memory foam, and an open-cell, springy layer for coolness and balance. With no springs or coils, it is suitable for all pressure-sensitive sleepers and is designed for spinal alignment and pressure-point relief. This mattress is not a typical memory foam mattress; it incorporates memory foam as part of the structure, but it’s not made of just the memory foam. The mattress is cool, supportive, and designed for all sleep positions. The mattress comes with a 100-night sleep trial with a full refund if you’re not satisfied at the end of the trial. It also has a 10-year limited warranty. At under $1000, it’s one of the best king mattressess in this entire guide, and with the RV SHORT KING it’s surprisingly best for the money. This 12-inch mattress is three inches of Gel memory foam and four inches of Art Cool Airflow foam on top of five inches of support foam. 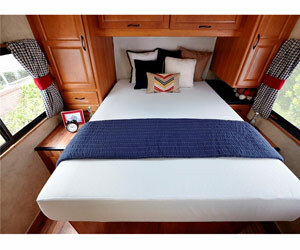 The mattress, designed for RVs, provides firm support, spinal alignment, and pressure relief for all sleep positions. The mattress sleeps cool and eliminates tossing and turning. The product comes with a 120-day trial and a 30-year limited warranty. 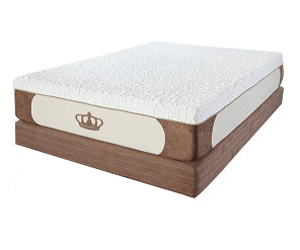 Here’s another king mattress for under $1000, only it’s by Brentwood Home. The Brentwood Home Cypress mattress is made with third-generation memory foam, for quicker responsiveness and reduced trapped body heat.The mattress itself is eleven inches thick, with the top two and a half inches made from gel foam. The top layer conforms to your body, providing support for your spine and relieving the pressure points causing you to toss and turn all night in a vain attempt to get comfortable. Also, the mattress eliminates motion transfer, so you and your partner’s motions are not felt by the other. The mattress is covered in a bamboo-derived rayon and polyester cover lined with New Zealand wool; the wool wicks away moisture and controls odor, while the bamboo cover keeps the sleeper cool. The mattress is medium-firm; this is great for stomach sleepers and back sleepers, but a side sleeper may want a more firm platform than this mattress provides. 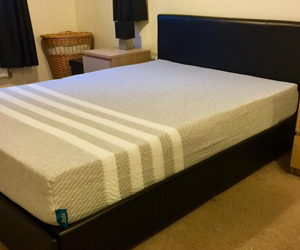 Because the mattress is foam, and no springs are involved, this mattress is great for fibromyalgia patients, and others with sensitivity issues as well. If you need a king size mattress or a 10-inch memory foam mattress with a gel cool design, the Perfect Cloud UltraPlush is your best bet under $1,000. The Perfect Cloud mattress is built in three layers: six and a half inches of HD Support base foam, a two-inch layer of Gel-Max memory foam, and a one and a half inch top layer of Air Infused Memory Foam. This top layer gives the sleeper relief from pressure points and combines with the second layer to sleep cool through the night. The three layers together provide spinal alignment and pressure relief for all sleep positions, and the absence of springs and coils makes it suitable for pressure-sensitive sleepers. The mattress comes with a removable stretch-knit cover; the cover allows air to flow in and out of the mattress, keeping it fresh and cool, and is easy to care for. Mattresses purchased through Amazon come with a 30-day trial, and the product has a 10-year warranty. The Shiloh 12” memory foam mattress is constructed in two layers – a nine and a half inch bottom layer made with Support-Plus foam, and a two and a half inch top layer of SureTemp memory foam. The bottom layer provides a medium firm support, for average to bigger body types; this layer gives the mattress enough support for all sleeping positions, providing spinal support and relief for pressure points. 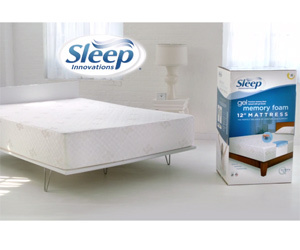 The top layer provides cushioning and comfort to eliminate tossing and turning during the night. 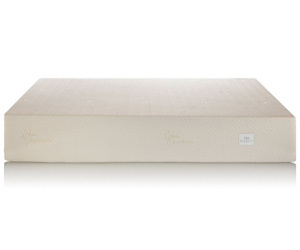 The Leesa Queen 10-inch mattress is composed of three layers – a core support, memory foam, and the top layer is Avena. Avena is an alternative to latex; it provides the same support, feel, and comfort of a latex mattress, but with much greater durability. Avena will not crumble or crack, allows for constant airflow throughout the night, reduces compression over time, so you don’t develop “sunk spots” in your mattress. The memory foam provides spinal alignment and relief from pressure points, so the mattress is suitable for all sleep positions and for pressure-sensitive sleepers. The product comes with a 100-night trial; if, at the end of the hundred days you are not completely satisfied with the mattress, return it for a full refund if purchased through Amazon. This zinus short queen size is one of the cheapest mattresses of the zinus series, and it still holds pretty good value at just under $500-$1000. This short queen size mattress delivers comfort, pressure-free sleeping on a memory foam infused with plant oils to keep it fresh and cool. The top two layers are three inches of memory foam, and two inches of comfort foam. 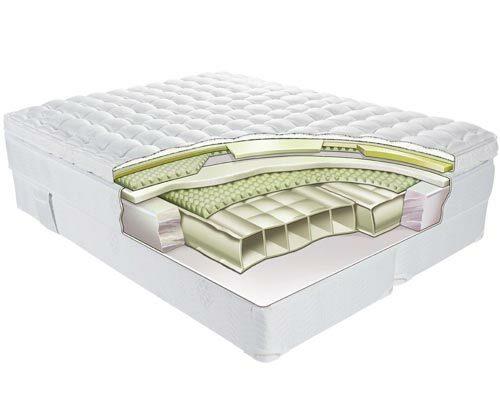 The memory foam provides cushioning and support, keeping the spine aligned and relief from pressure point pain. The second layer keeps the mattress cool, with ventilating airflow. The bottom five inches provides firm support. The foam in this mattress is different from straight-up memory foam; some of the petroleum used in making the foam is replaced with green tea extract, natural plant oils, and a mixture of active charcoal. This BioFoam keeps your mattress fresh and odor free. Designed with the RV bedroom in mind, and it comes with a 10-year warranty. The mattress provides a cool, supportive, pressure-relieving night’s sleep, suitable for all sleeping positions, as well as pressure-sensitive sleepers. The mattress comes with an elegant stretch-knit cover, easily removable for cleaning. The product comes with a 10-year warranty and a 30-day trial. 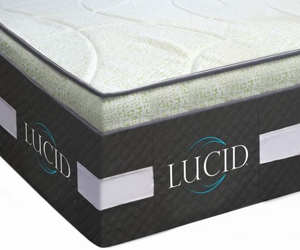 This 16 inches Lucid mattress is larger than most memory foam mattresses, coming in at below $1000. The base is ten inches of firm support, topped by three inches of latex, topped by two inches of memory foam, with a one-inch layer of bamboo and charcoal memory foam. The bamboo and charcoal layer promotes freshness and odor control, as well as comfort. 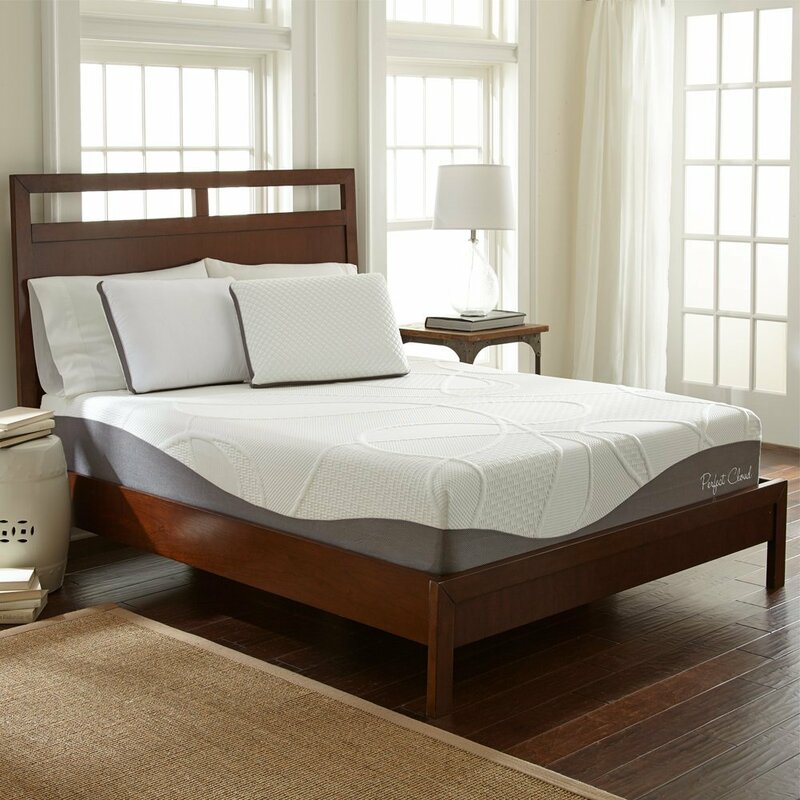 The latex and memory foam layer provides spinal alignment and pressure-relief for all sleeping positions. The absence of coil technology makes it suitable for pressure-sensitive sleepers. The product comes with a 25-year warranty. The first thing to look for is the certification and warranty. At this price point you should be getting a ten-year warranty at least. The manufacture should also be certified by CertiPUR-US if you’re buying memory foam, or have a Greenguard gold certificate. You can also expect to deal with a US-based manufacturer and excellent customer service. Try to avoid the latest technologies and focus on the basics. With memory foam you want layers and ventilation. A traditional spring coil mattress should have a high-coil count with S-shaped or individually wrapped coils. Latex should be latex and not enhanced by polyurethane. A $1,000 budget is enough to give you access to most types of mattress. If you’re looking for premium quality without a premium price tag, try downsizing. You can get some of the finest materials on the market at a reasonable price in twin or queen size mattresses. When it comes to comfort, it’s all about what feels comfortable to you. When buying online always take up a free trial period if its available. If you can’t get a trial period, you’d be better off going in-store to try the mattresses out before you buy. Edge support is important if you’re living in a shared house or limited by space. A bed with firm edges can double up as a sitting space for work or socialising. Memory foam mattresses fare worse when it comes to edge support due to their adaptive qualities. The same goes for latex. Coil based mattresses always perform best on edge support so, if that’s important to you, invest in coil. If you’re opting for coil spring or latex, cooling features are going to be less important. When it comes to memory foam heat is a problem. Foam is dense. That density means there’s no-where for the heat to escape resulting in a hot mattress. To counter-act this problem most manufacturers will add technology. Cooling gel is the most common which helps to dissipate heat. The best cooling feature is a honey-comb design which will promote air-flow as well as a coil-spring although, you’ll have to look hard to find one under $1,000. It’s also worth thinking about covers and ventilation when it comes to cooling. A breathable cover can make a world of difference to your sleeping experience. We’d recommend looking at Oetko-Tex, which wicks heat away, or micro-ventilated weaves. If you suffer from asthma or have a skin condition buying hypo-allergenic will be a necessity. Latex as a material is naturally hypo-allergenic and some poly-urethane foams are too. Make sure you look for the CertiPUR-US symbol when buying which signifies a mattress with low chemical emissions. The biggest advantage of shopping in this range is that you don’t have to sacrifice quality for price. This money will get you a high-quality mattress with a range of materials to choose from. If you shop cheaper the mattress won’t be comfortable nor will it last a long time. If you’re spending more, the chances of ending up with an expensive flop are higher. Shopping in the $1,000 price range will get you a mattress that will last up to ten years and be exceptionally comfortable. If you’re buying memory foam, $1000 will go a long way. At this price-point you can expect to pick up a multi-layered design using support, comfort and memory foam. If you look hard enough, you can even find gel-based memory foam. If you’re shopping at the bottom end of the budget make sure your purchases are CertiPUR-US certified to avoid emissions. Coil spring mattresses are the most common in the under $500 range. If you’re spending almost double that you can demand a high-coil count (at least 200+). If you shop around you might even be able to find S-shaped or individually wrapped coils which last a lot longer. A latex mattress, although expensive is possible on a budget of $1,000. The Huffington Post rate Latex as their number one choice for mattress fabrics. Its natural, breathable and adaptive to the shape of your body. Hybrid mattresses use a combination of inner coils with memory foam to deliver bounce and comfort. These tend to be in the lower half of the budget. If you’re a hot-sleeper who doesn’t want to miss out on the memory foam experience, investing in a hybrid is a great idea. So, let’s wrap things up. Your budget gets you access to the three main types of mattress materials: latex, memory foam and hi-count coils. Which of those is your ideal material will largely depend on you. We’d recommend taking out a trial period if you’ve never experienced a material before. 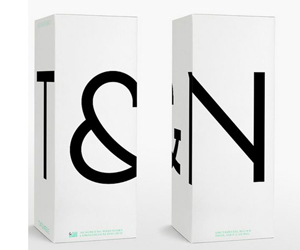 Equally, we all have a different idea of what firm, medium firm and soft really are. If you can get to a mattress store then don’t be shy. Try the mattresses before you buy them to find your perfect pick.